What is Sigma Gamma Tau? 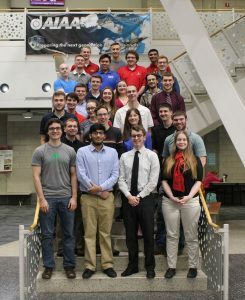 Founded in 1953, Sigma Gamma Tau is the honor society for Aerospace Engineering. It seeks to identify and recognize achievement and excellence in the Aerospace field. Sigma Gamma Tau’s affiliate chapters elect annually to membership chapters those students, alumni, and professionals who by conscientious attention to their studies or professional duties uphold this high standard for the betterment of their profession. Sigma Gamma Tau currently has more than 14,000 inducted members. Sigma Gamma Tau was founded on the campus of Purdue University in West Lafayette, Indiana, on February 28, 1953 “to offer appropriate recognition to persons of superior scholarship, outstanding character, and professional achievement in the field of Aeronautical Engineering.” The new society was formed by the merger of two existing societies, Tau Omega, founded in 1927 at the University of Oklahoma, and Gamma Alpha Rho, founded in 1945 at Rensselaer Polytechnic Institute. The name of the society was selected by combining the Greek letter Sigma, indicating sum, with Gamma and Tau from the initial letters of the parent organizations. Since 1953, the society has grown from 14 to 49 collegiate chapters and from 1,900 to 14,000 initiated members.